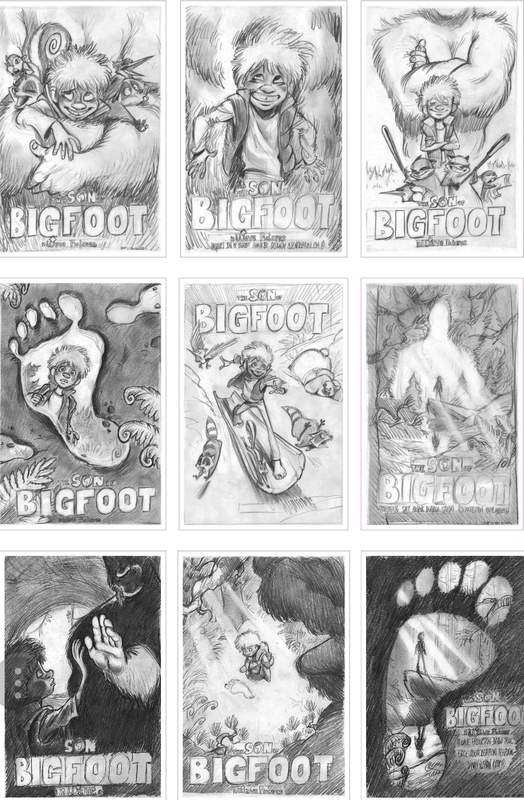 As some of you know I got three (3) "The Son of Bigfoot" posters. It's awesome but I think (I said I think!!) I will give away the other two (2) to random people. 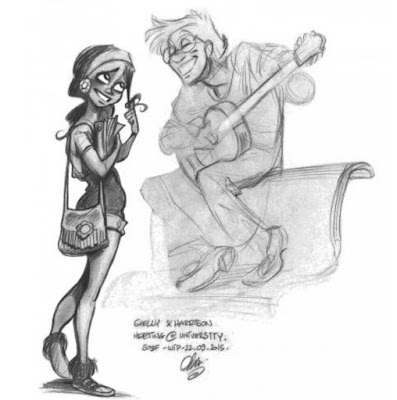 Okay but besides that, this post is dedicated to Olivier Senny (Olsen) who was kind enough to gave me permission (Yay!) to post pictures on this blog under the condition that it isn't used for "commercial uses" (I don't know what it means) (-_-) I'm going to look it up right now. Be right back. Nevermind, I know what it means right now. Cal, I sent you a video message (probably not reading this). Also do you know where I can find "The Scriptwriters Bible"? To those that I email or Direct Message... I want to just say that I am sorry. The reason why is because I am a real pest and sorry for "bugging" you if I did. I'm like a five year old... inquisitive about everything. Like I said, I got permission to post pictures. But i'm going to show a few of my favorites which look actually awesome. The one that I like the most is the top right one. Olsen had to draw a few poster ideas and I liked all of them. *Sigh* Just wish they came to life but I guess that's why people always do a few drafts before coming to a final decision. Yet my question still remains unanswered... who the heck trusts a squirrel with a taser?! 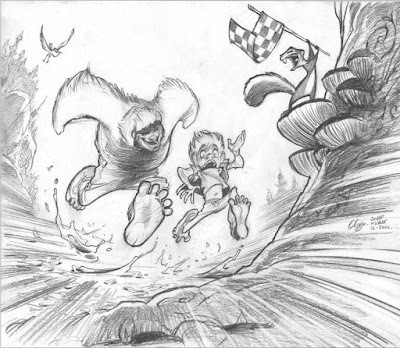 This picture of Adam and Bigfoot always gets me. I'm still trying to figure out who won... Adam or Bigfoot? Fact: Trapper was based on Bob's childhood toy raccoon. I am so going to put this in my script on how Shelly and Bigfoot met. They look so cute. nWave wanted Olsen to make Bigfoot as a loving and caring father, not as a Chewbacca. I remember this October morning. I sat in the Metro and held the script of Cal Brunker and Bob Barlen in my hands. The letters "The Son of Bigfoot" shone in "mail" 12 on the first page ... 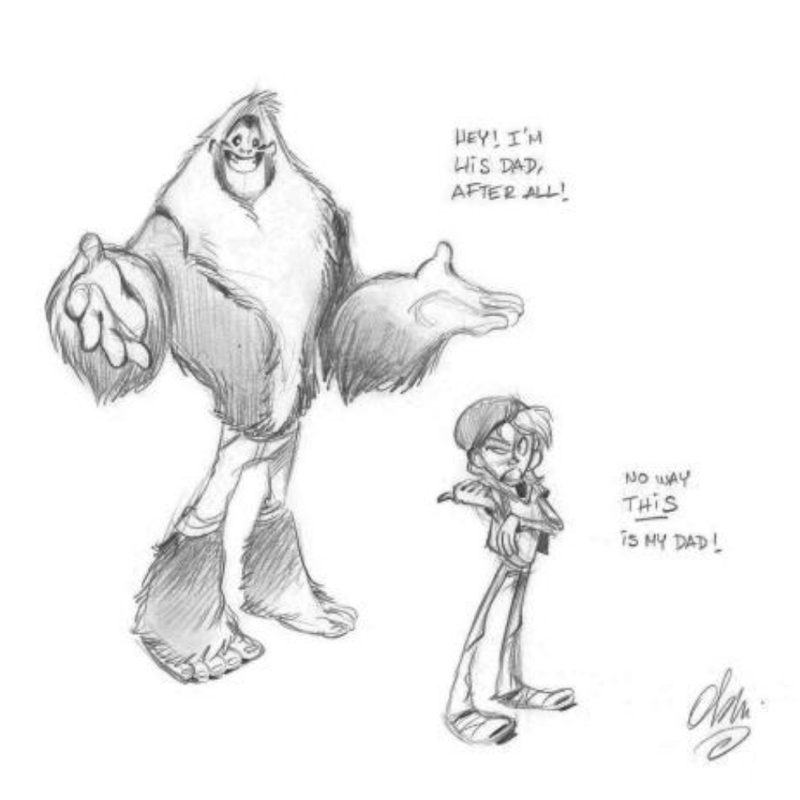 I discovered as a kid in front of the trailer of the next Disney that I was going to create Bigfoot! Once the buttocks alongside Sylvie and Jeremie at Studios nWave, finished the daydream, we had to throw ourselves. I grabbed my pencil and plunged back into my clones. My little sister - Amandine - and I have always been fascinated by the world of cartoons, while our father was collecting comics. Coming from this mixture of Chinese ink and cello, I went there, taking inspiration from the monsters of my childhood. Well, it was that he had spent a decade hidden in the forest, our Bigfoot. It needed the paternal sweetness of Sullivan (Monster Inc), the impressive stature of Glenn Keane's Beast (Beauty and the Beast), but also the wild touch of the Hebus Troll (Lanfeust of Troy). All these fantasies scratched on paper led me to consider a disheveled and gigantic beast, with huge legs clothed in foliage and animal carcasses. Sylvie reminded me not to deviate too much from the theme of the film. 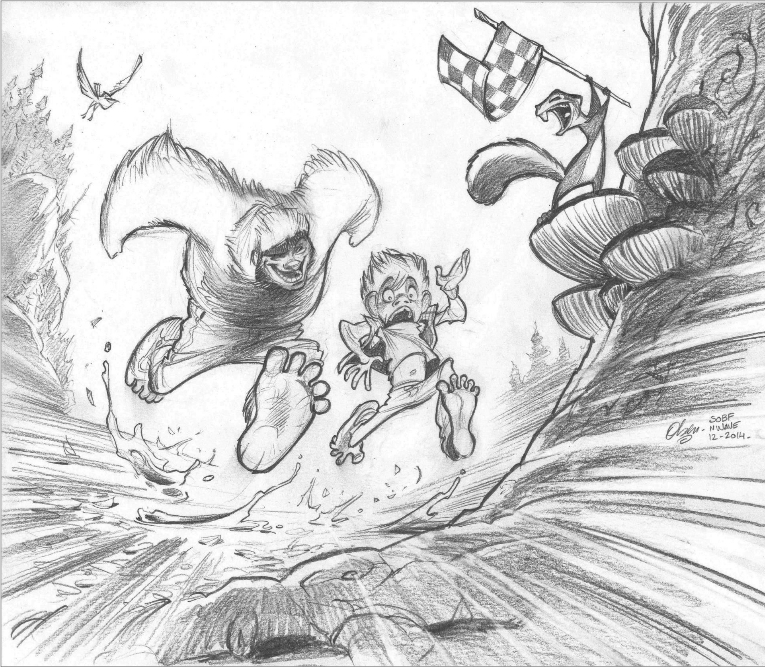 "The Son of Bigfoot" was not the story of a kid and his Chewbacca companion, but that of a father and son. Little by little, my Bigfoot sat up on his paws and assumed the appearance of a dad. A super daddy sweaty sweater with big palluches, but a dad. The process of creating Adam and Bigfoot aller from pair, from this day. The design appealed to the production and the hairy sturdy flew to the 3D department. He still retained the brown-red fleece of the famous Troll from Hebus. Later, when Bigfoot and the others came to life on the screen, Sylvie, amidst confusion and amusement, came to see me. Re-adjusting the headband in her hair, she confided in me, with a shared pout: "There is one thing I wonder:" How does Bigfoot do to change pants? I'm also trying to figure out that mystery. nWave, could you help us out with that question please? Or maybe Cal and Bob could help us out with that! 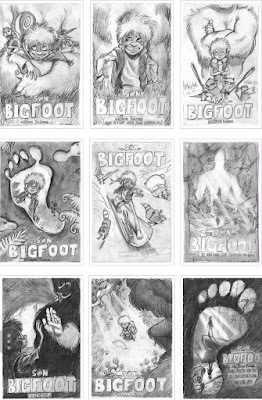 The next blog will either be about Bullying (Part 2) or do you guys want more of "The Son of Bigfoot" pictures?